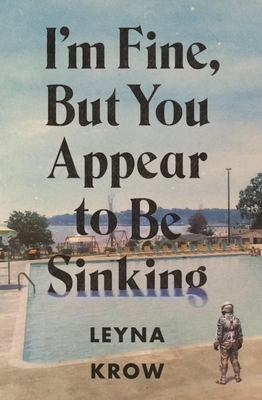 In I'm Fine, But You Appear to Be Sinking the strange and the mundane collide. These are stories of strange experiences set in familiar places, and of familiar experiences set in strange places. Many of the pieces in I'm Fine take place close to home, in suburban neighborhoods, or rural communities. The settings are conventional, yet something unexpected, or even magical, is occurring. In one piece, a couple speculates about random objects that appear without reason in their backyard. In another, neighbors try to figure out if a local meth dealer is keeping a live tiger captive on his property. In other pieces, it's the setting that's fantastical, but the characters' reactions that remain ordinary, like in the titular story where a journalist lost at sea and hunted by a mythical ocean creature admits to struggling with loneliness and isolation in much the same way he does even when he's safe at home. Although they are not directly linked by any specific character, the pieces in this collection are bound through reoccurring imagery and a shared theme of protagonists in emotional peril. There are unexpected appearances and disappearances, movement of inanimate objects, the search for something lost, the finding of something unusual. There are prophesies, dreams, unidentifiable creatures, and environmental catastrophes on a scale both large and small. There are action figures and octopuses, sullen teenagers and missing cats. At their core, these stories are imbued with mystery, oddity, humor, and empathy. They each stand on their own, but mean considerably more when read together. Leyna Krow's stories have appeared in Hayden's Ferry Review, Prairie Schooner, Ninth Letter, and elsewhere. She lives in Spokane, WA.